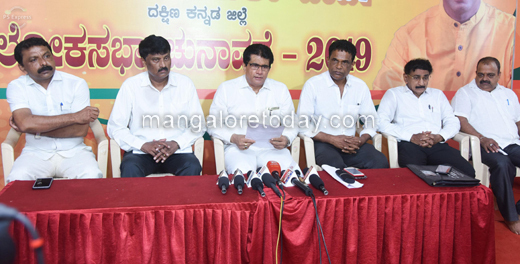 Mangaluru, Mar 30, 2019: The BJP which has accused the Congress in the district of spreading fake news regarding the BJP Lok Sabha candidate and sitting MP Nalin Kumar Kateel, has threatened to initiate legal action against this. Speaking to reporters at the party office here on March 30, Saturday, District BJP Legal Cell Convenor K Shambhu Sharma alleged that the Congress was resorting to such tactics out of fear of losing the elections and was spreading fake news through digital and electronic media. "The Congress is spreading fake news that Nalin was seeking votes in the name of religion and was even using the name of Ajith Kumar Rai Maladi for the sake of votes," Sharma said and added that Ajith Rai Maladi has himself issued clarification and has even complained against those who have misused his name. Stating that a private news channel’s news regarding Nalin wooing voters in the name of caste and community was completely false, Sharma alleged that the Congress which has resorted to caste based politics was trying to divide society. 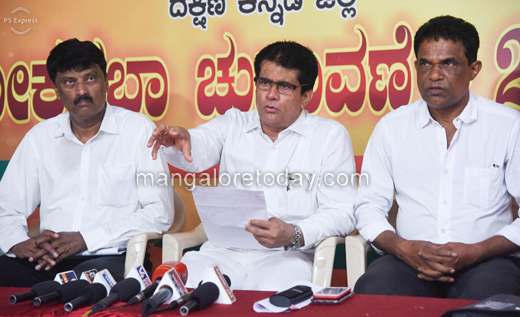 Jagadish Shenava and other leaders were present at the press meet.